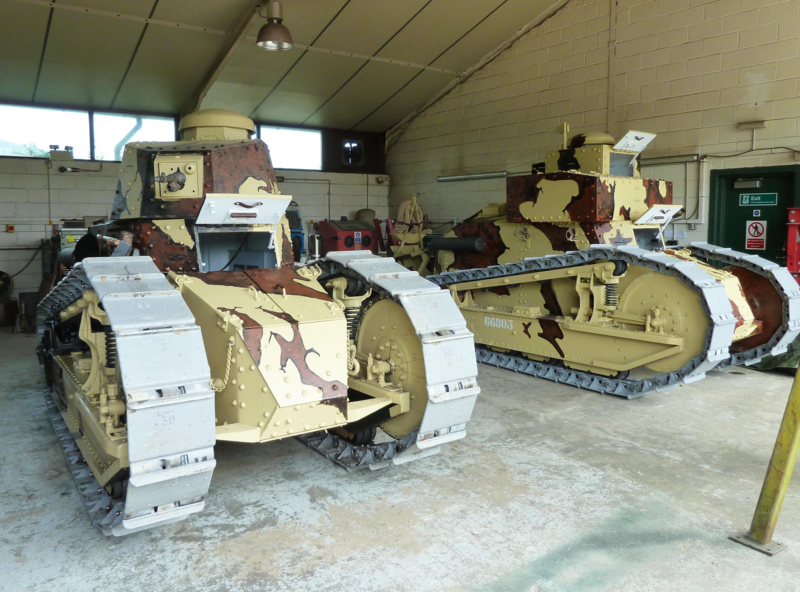 Weald Foundation are pleased to announce they will be presenting their WWI Collection of French Renault tanks at Militracks 2019 in Netherland. The event takes place at the War Museum Overloon, Netherlands. During the Militracks weekend, you can see German motorbikes, passenger vehicles, trucks, half-tracks and tanks, which were mostly in service with the Wehrmacht. In many cases, German vehicle technology at that time was more advanced than that of the Allies. Militracks shows – and in some cases literally – how that technique worked. The vehicles are not only set up statically but are also driving around on the special one-and-a-half-kilometre trail in the museum park. It is also possible to book a drive on many of the vehicles. Michael Charles Gibb, Director: We are thrilled to take both our Renault FT and TSF to Militracks as this will be the first time they have appeared together in a public event in Europe. This is also the first time a driving Renault FT and TSF have been seen together many decades – possibly since the Second World War. We are very grateful to Overloon Museum for hosting these two rare and important tanks at their spectacular show. This event is, without a doubt, the best vehicle collector meet in Europe. Overloon War Museum was opened on May 25th, 1946, making it one of the oldest museums in Europe dedicated to the Second World War. The museum is located on the site of the Battle of Overloon, a WWII tank and infantry battle between Allied and German forces that occurred in September and October 1944, in the aftermath of Operation Market Garden. The Weald Foundation Renault FT and Renault TSF side-by-side. Our First World War Renault FT light tank, widely and inaccurately referred to as a Renault FT17, ended its operational life entombed in concrete as a bunker. Prior to being buried all the interior and exterior fittings were stripped out, leaving only the hull, floor, turret and driver’s hatches in place. The turret disappeared sometime after the end of World War Two. The recovery of our Renault FT took place over several months, reflecting the size, weight and number of plates that had to be recorded, removed and transported to our workshops. The transportation of the plates took place over a number of trips. These were eventually laid out like a giant jigsaw puzzle to enable us to photograph and identify each component and provide a lasting resource for the research effort to come. The hull and related components thereafter languished in a far corner of our sheds for many years before we began to address the issue of restoration. WW1 forced many innovations in military science, not least in the area of communications. The tank evolved out of the need to restore mobility to the battlefield. The French Renault TSF (Télégraphie Sans Fil) evolved to meet the need to communicate once mobility was returned. General Jean Baptiste Estienne ordered 200 in January 1918. This was increased to 300 in April 1918. Approximately 180 were finally produced but less than 50 were accepted by the French War Office during WW1 and half as much accepted by the Artilllerie Speciale units themselves. The Renault TSF is a much rarer, but as historically important, type of vehicle when compared to the Renault FT. Given the innovation encapsulated in the Renault TSF the Foundation intrinsically as interesting as gun armed tanks. Sadly, a number of Renault TSF have been collected but altered to the FT configuration by replacing the blockhouse superstructure with a revolving turret equipped with either a machine gun or Puteaux 37mm cannon. There is every possibility our TSF was assembled before November 11, 1918. There is a good chance, given its registration number 668, that it was accepted by the French Army. This just leaves the small matter of which unit received it. We assumed this information would be relatively easy to isolate yet registration number-based issuance records within any military archives are thin on the ground. If you wish to find out more about our collection click on the link. The Weald Foundation was established to preserve, and maintain historic tanks and related military vehicles and equipment, principally from the First and Second World War and to educate the public about their history. Our mission is to be the World leader restoration based on accurate research and location of the maximum number of original components.